You are currently browsing the archives for the daniel johnston category. I’ve never seen what all the fuss is about Daniel Johnston. Granted, I haven’t really made an effort to listen to the guy, apart from seeing the film “The Devil And Daniel Johnston” in which his music takes a backseat to his sad decline into serious mental illness. It was his “friends” on this outing that gave us the excuse to check him out; friends like Norman Blake from Teenage Fanclub, Mark Linkous of Sparklehorse fame, Scout Niblett and Yo La Tengo’s James McNew. There were short support sets from four of the friends, though sadly James McNew didn’t get a solo outing, instead he seemed happy to provide bass playing services throughout the evening. Jad Fair was first up and was highly entertaining, almost comedic, bashing away at a tiny electric guitar with no discernable skill while McNew and Blake provided backing for his lo-fi slacker rock. Scout Niblett was far more serious, her opener coming on like the sort of sparse alt.country that Jason Molina is so good at while she accompanied herself on drums for the cheery “We’re All Gonna Die”. Norman Blake was a bit of a letdown, unfortunately. I personally don’t think that TFC rockers like “I Don’t Want Control Of You” translate particularly well to an acoustic setting, although “He’d Be A Diamond” and the Scottish folk tune he played fared a little better. He ended with a new song that is no doubt destined for the next Fanclub release and sounded exactly like you’d expect. Mark Linkous seemed a bit cheerier on this occasion that I’m used to seeing him – he actively encouraged the crowd to sing along to “Homecoming Queen” – but we had to make do with just three short songs, acoustic again, which didn’t feel like nearly enough, though a rare outing for “The Most Beautiful Widow in Town” was most welcome. After being slightly underwhelmed with the support I feared I might be more underwhelmed with the main event when the portly, trembling Daniel Johnston took to the stage alone and began to play. It seemed a real struggle for him, hunched over his music stand – presumably reading the lyrics – while clumsily fumbling the chord changes as if he’d only picked up a guitar for the first time the day before. There was a strange childlike innocence to the performance but there was no denying the quality of the songs, and, indeed, the gravity of the lyrics. I might have struggled to enjoy an entire performance of this so was slightly relieved when he left the stage after two songs and returned five minutes later with friends in tow. From this point on the gig was a delight. 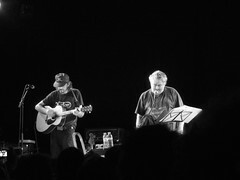 Johnston stuck to vocals while the rest provided a sturdy backing with Linkous, Niblett and Blake on guitar for the most part while Jad Fair spent the entire gig sitting on the stage banging a drum. Two songs I recognised – “Speedy Motorcycle” and “Hey, Joe” – were played early on and sounded better than I remember them being, particularly the latter which takes on The Beatles’ “Hey Jude” and wins hands down. The cover of the same band’s “Rain” was almost as successful while a couple of energetic rockers – “Rock This Town” and “Rock and Roll” (I think) – caught the attention with some excellent shouty backing vocals from Niblett. Johnston seemed to grow in confidence as the gig progressed and was much more lucid when recounting stories behind some of the songs than when he first came on the stage and stumbled over the band introductions, which he seemed to be reading off a sheet. After a sweet reading of “True Love Will Find You In The End” with Linkous for the encore he ended the set unaccompanied with the harrowing “Devil Town” and I must say that he did win me over in the end as the brilliance of his songwriting shone through on almost everything he and his friends played on the night. The non-stop involuntary shaking of his left arm was a constant reminder that he is not remotely in the best of health but it’s a blessing that he has the strength and courage, and the help of some good friends, to be able to continue doing what he was clearly put on Earth to do. File under daniel johnston,Gig Reviews,mp3,Reviews.